This is a special offer. Thank you for your interest in Killer Abstract Backgrounds volume 4! Killer Abstract Backgrounds v4 is a set of 30 high quality background graphics you can use to easily create awesome graphics. https://salvador.tradebit.com brings you this set for a low bargain price – even lower than the price of a single stock graphic. Use them over and over again, for multiple parts of your communication – without any further cost. Forget the need to pay again and again for every single use. No. Not here. No further cost. You get the Killer Abstract Background graphics as fully layered PSD files. They are completely and easily editable to your needs. This lets you use these awesome background graphics to create unlimited versions and variations without further cost. You only need a tool to edit the well-known PSD file format. Read more about Photoshop on Amazon.com. Read more about Photoshop on Amazon.de. Read more about Photoshop Elements on Amazon.com. Read more about Photoshop Elements on Amazon.de. If you do not want or need to edit the PSD yourself, you can convert the format into another one, JPEG for example. Read more about the viewer/converter. As a special bonus I have included JPEG versions of these beautiful backgrounds as well for you to use without any further effort. 30 (!) Killer Abstract Backgrounds in JPEG format (width 1024) for direct use in Powerpoint presentations, or as website graphics. 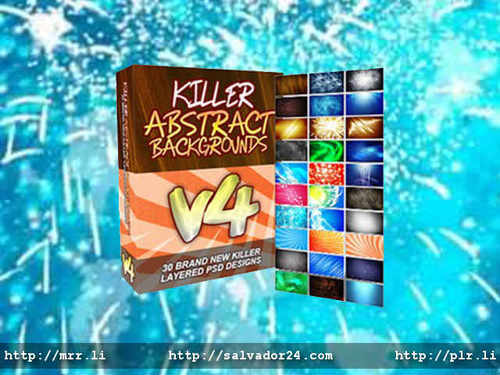 Get Killer Abstract Backgrounds v4 with the Bonus here now! View Killer Abstract Backgrounds v4 on tradebit.com. This entry was posted in Special Offers and tagged abstract, background, graphics. Bookmark the permalink. Your address is safe with us.